Britain's road race world champion Lizzie Armitstead started her season with a win in the Omloop Het Nieuwsblad in Belgium. 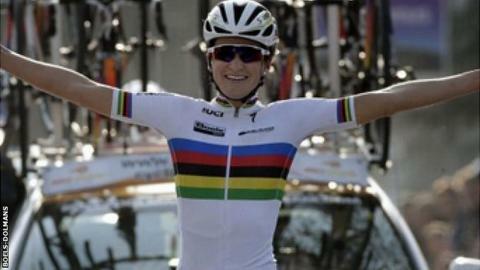 Racing in the world champion rainbow jersey for the first time, Armistead launched a solo attack with 10km to go. Her Boels Dolmans team-mate Chantal Blaak won the sprint for second and Tiffany Cromwell was third. She said: "That wasn't exactly the plan. I was out there way too long. Wow. I'm really happy." In the men's race, Britain's Luke Rowe, riding for Team Sky, finished fourth in a sprint finish, which was won by BMC's Greg Van Avermaet.